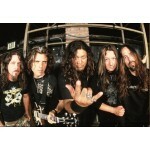 Testament is an American metal band from Berkeley, California,formed in 1983. They are often credited as one of the most popular bands of the 1980s thrash metal scene.In the 29 years since its inception, Testament has had numerous lineup changes, and guitarist Eric Peterson has been the only constant member, although the band currently also features two of its original members, Alex Skolnick (guitarist) and Greg Christian (bass). Chuck Billy replaced former singer Steve Souza in 1986, prior to the recording of their first studio album, The Legacy, and has been a member of the band since. To date, Testament has released nine studio albums, four live albums, six compilation albums, and six singles. They were one of the early thrash metal bands to sign to a major label (Atlantic Records, in 1986). The band released their debut album The Legacy in 1987 and achieved moderate success with its three follow-ups, The New Order (1988), Practice What You Preach (1989) and Souls of Black (1990). Testament achieved its biggest success with their 1992 follow-up The Ritual, which debuted at #55 on the Billboard 200 charts, the band's highest ever chart position in the United States.The band also has two Top 40 albums and one Top 50 album to its credit in the UK. Their ninth studio album, The Formation of Damnation (2008) entered the Top 20 in Germany at #15, while its 1999 predecessor The Gathering entered the Top 50 in that country. Testament recently finished recording a tenth studio album, entitled Dark Roots of Earth, which is tentatively due for release on July 27, 2012.